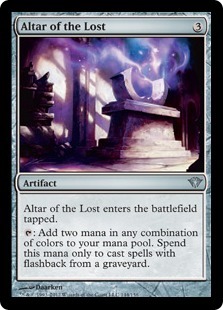 Altar of the Lost enters the battlefield tapped. TAP: Add two mana in any combination of colors to your mana pool. 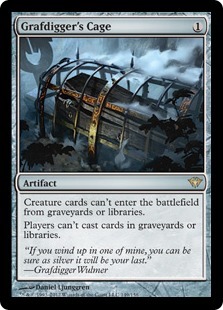 Spend this mana only to cast spells with flashback from a graveyard. Equipped creature gets +1/+0 and has vigilance. 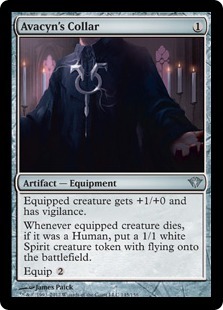 Whenever equipped creature dies, if it was a Human, put a 1/1 white Spirit creature token with flying onto the battlefield. TAP: You gain 1 life. 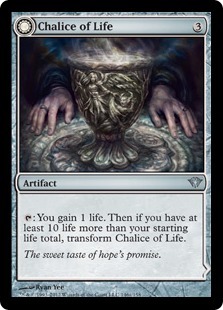 Then if you have at least 10 life more than your starting life total, transform Chalice of Life. TAP: Target player loses 5 life. 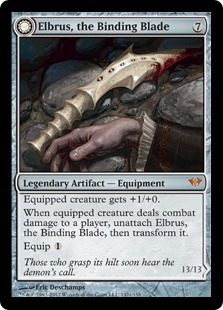 When equipped creature deals combat damage to a player, unattach Elbrus, the Binding Blade, then transform it. Whenever a player loses the game, put thirteen +1/+1 counters on Withengar Unbound. 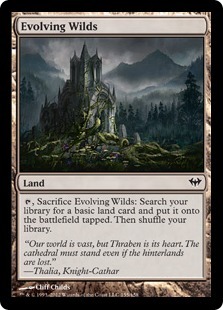 TAP, Sacrifice Evolving Wilds: Search your library for a basic land card and put it onto the battlefield tapped. Then shuffle your library. Creature cards cant enter the battlefield from graveyards or libraries. Players cant cast cards in graveyards or libraries. 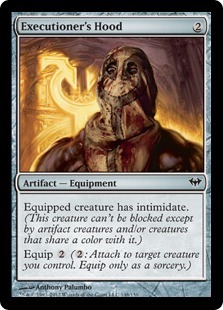 2BG, TAP, Sacrifice a creature: Draw a card. 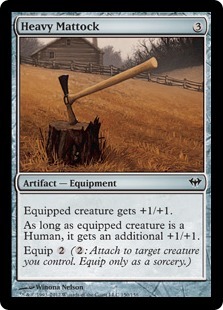 3, TAP, Sacrifice Haunted Fengraf: Return a creature card at random from your graveyard to your hand. As long as equipped creature is a Human, it gets an additional +1/+1.